Of the new series to premiere during the winter of 2013 portion of the 2012-2013 television season on Fox, The Following, starring Kevin Bacon and James Purefoy and created by Kevin Williamson ended up being among the best along with NBC's Hannibal, which started later, but despite the slight premise similarity, ended up being two very different and equally engaging thriller programs. Broadcast television is in some cases following the model of programming associated with premium cable channels with several shows on Fox and NBC ironically enough following a 12,13 or more episode season and if renewed, returning the next season either in the summer, fall, winter, or spring for a new series of episodes. CBS followed the same formula for Stephen King's Under The Dome during the summer and it is a trend that I hope will continue especially in light of the increased amount of people who have cut the cord and now rely on a combination of free over the air broadcast channels mixed in with streaming television both on demand and live through services like ROKU. 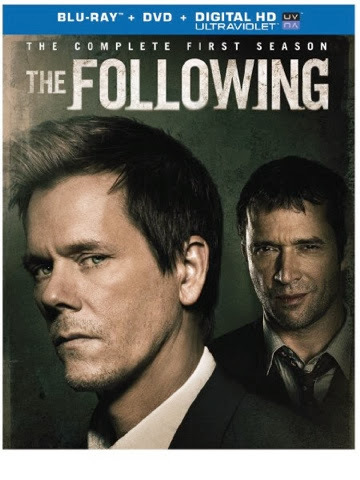 The Following stars Kevin Bacon as a former FBI Agent with skeletons in his closet that is drawn back into service when a cult following a killer (James Purefoy) he put away kidnaps his stepson and eventually his wife. The son is actually the son of the killer, who was a brilliant novelist and professor with expertise particularly on the works of Edgar Allen Poe. When his following attacks, the works of Poe are often referenced and soon the Agent discovers he is in a game of cat and mouse with a manipulator whose followers are writing their own "chapters" in a book the killer is writing and only the author knows the endgame. Warner Home Video presents The Following on Blu-ray Disc within a large multi disc blue BD case that includes all fifteen episodes on three dual layered Blu-ray Disc and the episodes look incredible in 1080p full HD with enveloping English, French and Spanish Language DTS-HD MA 5.1 Surround Audio with English Subtitles for the Deaf and Hearing Impaired and French, Spanish, Swedish, Dutch, Norwegian and Danish Language Subtitles encoded as options. There are also four dual layered DVDs containing 16 by 9 enhanced standard definition presentations of all 15 episodes with English 5.1 and Portuguese Language Dolby Digital Surround Soundtracks coupled with English Subtitles for the Deaf and Hearing Impaired and Chinese, Spanish, French, Portuguese, Korean and Thai Language Subtitle choices. There is also an insert with a limited time only code for an Ultraviolet HD Digital Copy as well. Bonus features include an extended version of the pilot as well as featurettes regarding the creators of the series and companion shorts on the characters, production and an audio commentary for the season finale as well as deleted scenes among the extra value content. The second season of The Following will premiere on Fox on Sunday, January 19, 2014. Please check your local broadcast listings for time and to confirm the premiere date just in case a change occurs. The Following: The Complete First Season is available now at retailers on and offline courtesy of Warner Home Entertainment.